In today’s information-saturated age, people are often too preoccupied to notice what you’re offering unless it’s packaged and presented appealingly enough to break through all the noise. The book revolves around demonstrating the principles of making your messages “pop” or, rather, making your messages Purposeful, Original, and Pithy. It’s a book about sharing ideas and becoming more visible. American Idol is used as a demonstration of talent being important but not being “enough” on its own. The book assumes you have a specific message or product/service to promote and that you will be mentally applying the processes as you go. Lynn Truss’s Eats, Shoots, and Leaves is used as an example of standing out with a title. The book is about the importance of using proper grammar, but the title sells it. The first requirement of a POP pitch is to be “purposeful.” People need to be absolutely sure of what you do/offer from your image/introduction/slogans alone. Examples of memorable slogans are given. A pitch also needs to be “original” or one of a kind. Things that are original are appealing or, at the least, novel enough to try. When people ask, “What do you do?” or “Why should I buy this?” it’s your job to make a long story short. You can quickly tell if you’ve composed a sufficiently clear, concise, and compelling POP! message. Just share it with people and see if it passes the Jerry Maguire test. The “Jerry Maguire test” is when you tell people your potential title, tagline or elevator pitch and their reaction is visceral, notable, or strong. Confusion or indifference are bad signs. If someone can’t repeat your message back to you after you’ve told it, they didn’t “get it.” A bad sign. If someone can’t remember your message, you wouldn’t get their business. What problem does my idea or offering solve? Why is it worth trying and buying? Who are my competitors and how am I different from them? What is the purpose of my pitch? When, where, and how do I want people to take action? Significant assistance and guidance for each question is given in the book. The “alphabetizing technique” is where you take some of the “core words” relating to your product/service/message and make them more original by going through the alphabet and changing the sound of the first syllable. An example given is “yogurt” becoming “go-gurt” by going through ao-gurt, bo-gurt, co-gurt, etc. “Go-gurt” is suggested as a yogurt turned health food (to me it sounds like a good laxative name ;-)). A bar used the alphabetizing technique with their “happy hour” to produce “yappy hour”, a special hour for dog owners. Horn recommends registering the domain name for any clever words/names you come up with. Horn notes that the media are keen on “original words” that make an impression and they are more likely to be featured in soundbites and interviews. Try to “capture conversational catchphrases.” Pick up on unique phrases used in your industry or in relation to your message/product. An example given is a dull title of Build a Rewarding Career, Job Search Techniques compared to I Don’t Know What I Want, But I Know It’s Not This. Talking out loud is given as a technique for coming up with some of these by yourself. Come up with catchphrases that are linked to what the customer/reader wants to hear in relation to the product. For example, for a toothpaste company making a child’s toothpaste: Look, Ma. No cavities! Look for phrases and words from comment cards, reviews, and evaluations (or even those for competing products). You can “valley girl” book, song and movie titles, such as Mac the Night, The Whale Whisperer .. you’re giving the “like” by adjusting the title of something else. Anytime we elicit a laugh, people are more likely to like us and whatever it is we’re offering. Horn suggests using all sorts of humor (except adult, rude, offensive) in your message and pitches. Trashy newspaper headlines, etc. Freakonomics is given as an example of a book that uses a lot of POP techniques. The title, for starters, but also their ads: “If Indiana Jones were an economist, he’d be Steven D. Levitt.” Their abstract concept is made concrete with the cover’s image of a cut up apple with orange inside. Intriguing questions like “How is a beauty pageant like a crack dealer?” are on the cover. Blend two words into one. Examples: giraffiti, staremaster, Internut. The “ContraBrand” technique is when you take a contrary position in a message, such as a “TV is good for your kids” or an upside down Christmas tree (“leaves more room on the floor for gifts!”) .. difference stands out. Use “meaningful metaphors.” Take lots of words related to your topic area and use them in metaphors. Using a metaphorical approach can make standard things seem fresh/new. A woman who had a stroke but went on to a full and powerful recovery wrote a book called Stroke of Genius. Steal and change current pop culture phrases or references. Given examples are May the Fourth Be With You! and King of the Grill. The “Alpha and Omega” approach is when you add prefixes (e.g. re, dis, sub, un, inter, anti) or suffixes (e.g. ology, ize, er, ish, ate) to words. Alliteration can make you instantly eloquent. Never sacrifice clear for clever. Examples are better than explanations. Re-enact stories rather than “telling” them. Be visceral and active in your storytelling. Open eyes, ears, hearts, and minds with Aha! quotes. Comb newspapers for current quotes. Quote yourself, if you wish. Inspire action with specific next steps. Horn notes that the goal of a speech is not for people to think “wow, what a great speaker” but to actually do something (visit our site, hire us, recommend us, etc). I have been asked to write a blurb about this book. I figured I might as well write it here! POP! 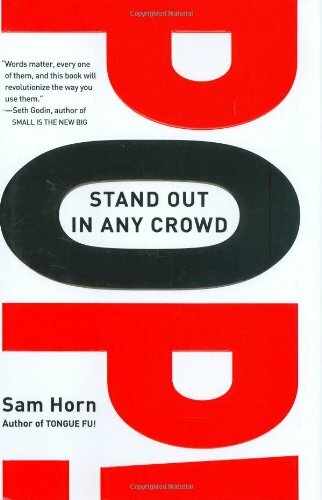 Stand Out In Any Crowd, by Sam Horn, is a practical guide to communicating your ideas and messages in a way that they’ll “stand out from the crowd” and be easily remembered. At its core, it’s about branding and communication, though these topics aren’t formally discussed at all. Instead, practical walkthroughs and examples of 20 or so branding and communications techniques are given and you’re shown how to use them on your own ideas, products, and services right away. The rationale for the ideas in the book is that talent and quality are important, but unless you can deliver your message in a Purposely, Original, and Pithy way (the “P.O.P.” of the book’s title) you’ll be fighting a losing battle against more solid brands and communicators. POP! shares the techniques behind catchy brands like Freakonomics, Eats, Shoots, and Leaves and Aflac and demonstrates how you can use them too. Significant assistance and guidance for each question is given in the book, and from your answers to these, you will eventually come up with a large list of “core words” that you can use with the techniques shared in the book. The “alphabetizing technique” in which you take some of your core words and look for more interesting variants by going through the alphabet and changing the first syllable of the word. An example is given of a yogurt health food where ao-gurt, bo-gurt, co-gurt, and so on are tried. Eventually “go-gurt” is considered as an original, catchy name. The “spell chuck” technique in which words or parts of words are switched with homophones, such as in “Curl up and Dye” for a hair cutting business and “VoluntEARS” for a Disney customer service program. Alternatively, you can put in a word that merely sounds similar as in “Authorpreneur” or “Entréepreneur” for entrepreneurs who are writers or chefs respectively. Try to capture “conversational catchphrases.” Pick up on unique phrases used in your industry or in relation to your message/product. An example given is a dull title of Build a Rewarding Career, Job Search Techniques compared to I Don’t Know What I Want, But I Know It’s Not This. Talking out loud is given as a technique for coming up with some of these by yourself. Invent and use “meaningful metaphors.” Take lots of words related to your topic area and use them in metaphors. Using a metaphorical approach can make standard things seem fresh/new. A woman who had a stroke but went on to a full and powerful recovery wrote a book called Stroke of Genius. These points are merely a single toe dipped in the water of the depth of techniques covered in POP! Once you’re done coming up with names, slogans, and metaphors, Horn presents a litmus test for a successful message called the “Jerry Maguire” test (this, in itself, is clever, memorable naming at play). If you give your elevator pitch, tell people your title, slogan, or tagline, and their response is immediate, interested or visceral, you’re on to a winner. And so it goes with POP! Horn practices what she preaches throughout the book by using lots of catchy titles, slogans, and metaphors but, importantly, she uses these devices to dispense solid advice and techniques we can all use to promote ourselves and our ideas.